SynAudCon introduces new training aid for the “Sound System Design” and “OptEQ – Equalization De-mystified” seminars. I love demos. There’s just something about seeing and hearing in real time that trumps learning concepts from a text book. It’s fun to watch people’s “light come on” when a demo really hits home. 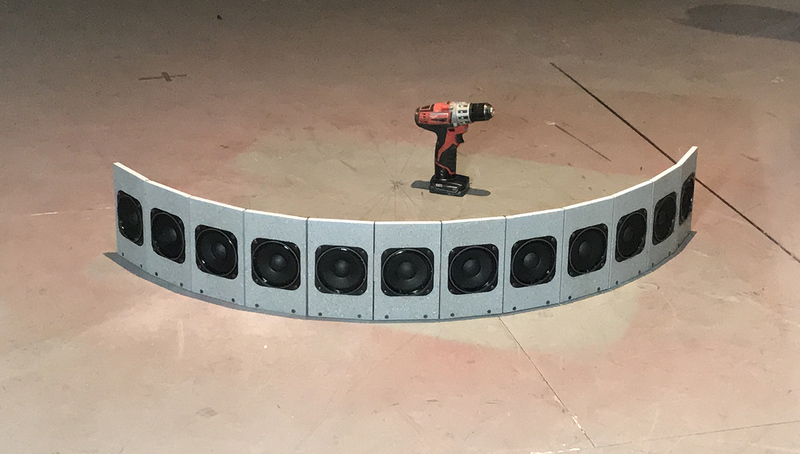 For many years, Jon Taylor of d&b audiotechnik has used a flexible array as a teaching tool. He described it to me a few years back, and several individuals had very favorable reviews. While he offered to build one for me at the time, it was a project that I was sure I could tackle, and it went on the “Do This” list for seminar demos. With our Sound System Design and OptEQ seminars looming on the horizon, I finally got around to doing it. 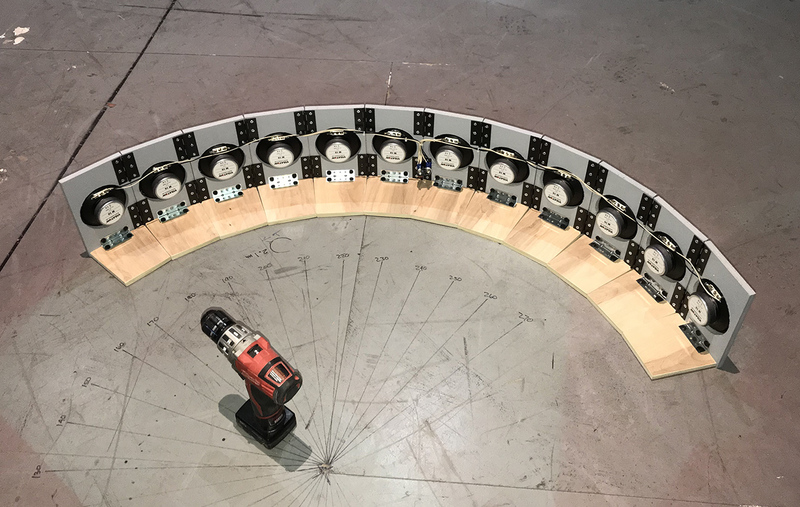 The “Flexible-Array” is a 12-element array that can instantly change shape between straight, curved, and half-curved. The elements are sealed-back mid-high frequency drivers – each mounted on a 5-in. by 8-in. baffle. The baffles are hinged to allow bending, and the base provides stops to assure the proper array shape. It is at home on a ground plane or in free space. 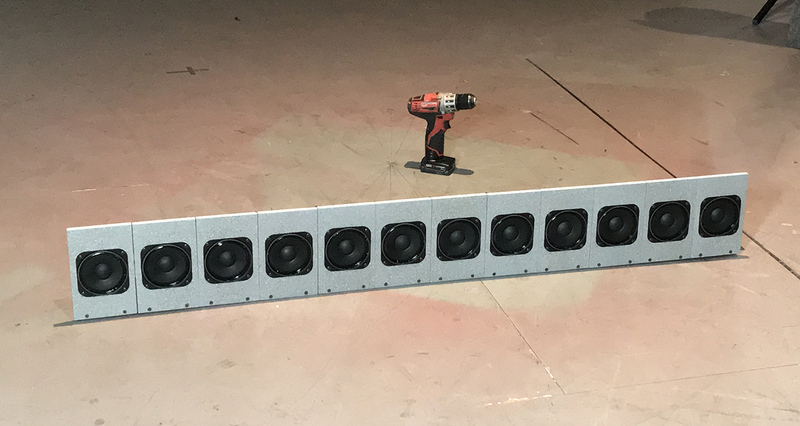 For classroom demos it will usually be positioned horizontally, allowing the class to hear the vertical coverage pattern for a deployed array. I intentionally used a device spacing that is excessive in the 8 kHz octave band. It is important to hear how an array behaves when it “breaks up” due to phase interference. and a host of other concepts. 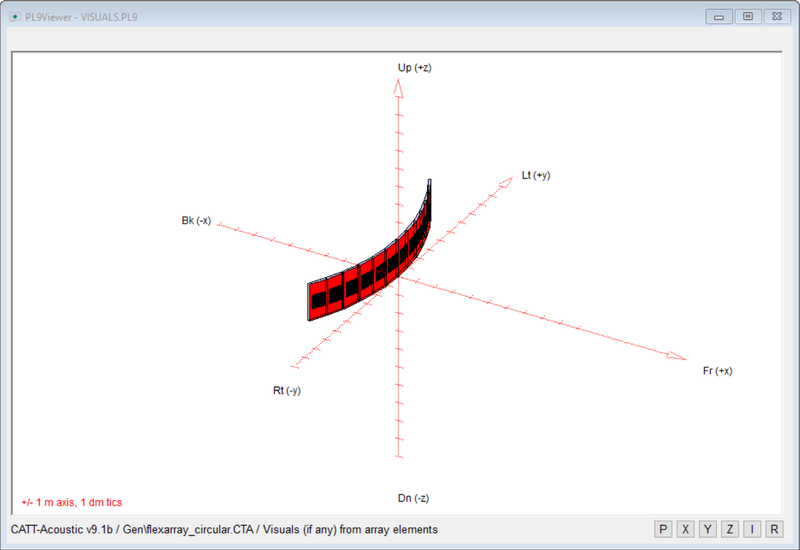 We’ll use CATT-Acoustic to examine the predicted behavior of the array, and compare it to the actual behavior. It’s a great lesson on what can be modeled with accuracy on a PC. Above: The Flex-Straight, Flex-Curved, and Flex-J on a ground plane. The battery-powered drill is added for scale. Below: The predicted horizontal polars for the Flex-Curve configuration. 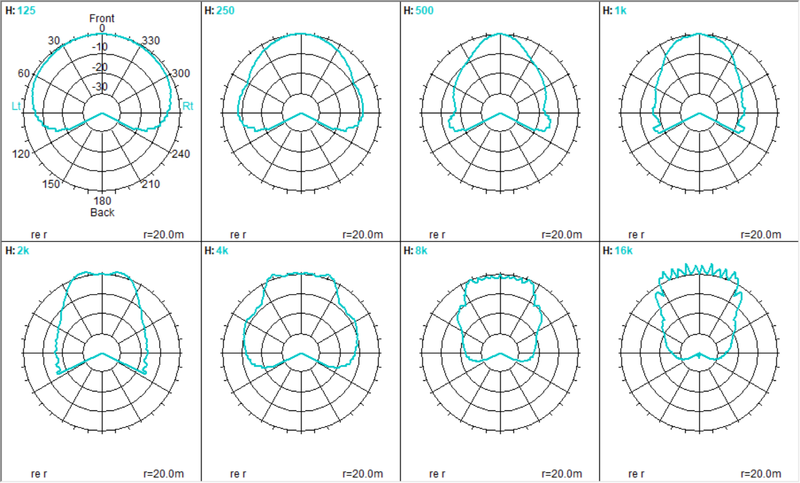 These are front lobe-only and at 1/1-octave centers. Many other resolutions are possible, depending on what is being investigated (courtesy CATT-Acoustic). 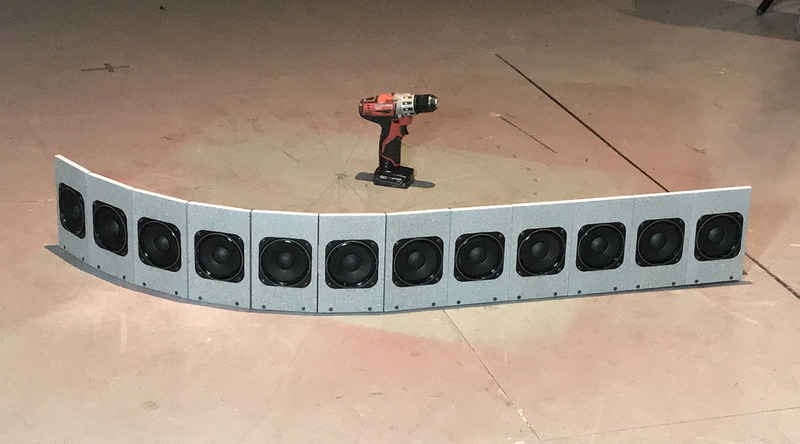 Listening Opportunity to Compare No Treatment, Absorption and Diffusers Manufacturer Supported Loudspeaker Designs – Is There a Cost?